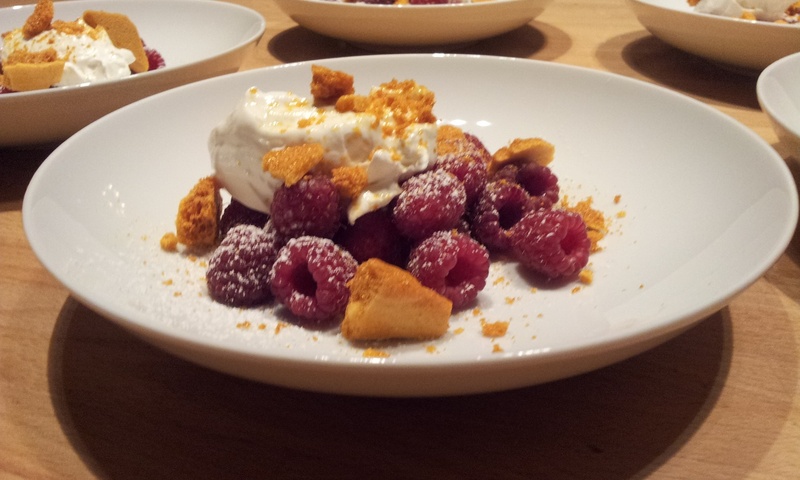 A Normandy Kitchen: Raspberries and some crunch! I like this! Sometimes soft fruits need a little bit of crunch, and this is easy. Not to mention that you don't need to turn on the oven in this hot weather. Your are right, I made the honeycomb in the afternoon with my friends children. I had gasps of excitement when I added the bicarbonate of soda! That way all the cooking was done outside on the barbecue in the evening! I hope the weather isn't too hot for you! Thank you for joining my blog and your very kind words. I went to see your blog too, which is very good and so pretty. Aston woofs 'Hola' also, he is hiding in the shade!